The imagination of Charles Dickens has come alive with life-size mannequins lining a five-block stretch of Cambridge, Ohio. 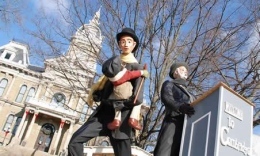 The 186 mannequins and 80 scenes depict images from Dickens’ “A Christmas Carol” and include characters like Tiny Tim. Each figurine’s face was sculpted and painted by local artists, and the clothes were donated or found at thrift shops. High school students studying building at the local vocational school made each body. Throughout the six years of the Dickens Victorian Village, the scenes have acquired new sculptures. Visitors are able to explore historic architecture in the form of old-fashioned shops and restaurants, while also learning about England’s history. On Nov. 10, the Guernsey County Courthouse’s holiday lights and music show will illuminate downtown Cambridge. Also on Nov. 10, the Great Expectations Chocolate Walk will allow visitors to explore the world of chocolate. However, tickets for this event are sold out. An old-fashioned pub crawl — which includes a tour of four taverns and beverages like ale and wassail — will take place Nov. 12. Last year, four contest winners were chosen to have their faces sculpted and placed in the scenes. Jonett Haberfield, committee co-chair for the Dickens Victorian Village, noticed a steady boost in economic development for the businesses as the project matured. Recently, the town has undergone a major renovation to its downtown area. New street signs and lampposts have been added throughout the area. Founder Bob Ley envisioned the project after seeing the amount of tourists during a trip to Oglebay Park in Wheeling, W.V. Ley originated sketches of each scene, proposed the idea to 17 people on a city board and received the approval of 16. The mayor started the project with $1,000, and a committee was formed. From adolescent to elderly, the participation rate in the development has been lofty. As a participant, Haberfield finds the whole experience exceptionally stimulating and is impressed with Ley’s efforts. Ley said the event has brought together community members. Ley recalled a time when he saw about 10 children wrapped in blankets sitting in the bed of a truck. The family traveled to see the display. The objective of the project, which is displayed until Jan. 7, is to bring the Christmas spirit to its visitors.